After considering an eel in my reef for the last couple of years, I finally bought one. It is 10-12 inches long and 1/2 -5/8" in diameter. I have been giving him a 1/2 of a silverside fish each evening, which is pretty entertaining! How much /often should I be feeding this guy? Also are there other foods for eels? BTW, I do have a tightly sealed top. ya snails, shrimp or crabs for these guys. They have somewhat flattened teeth meant for breaking shells instead of sharp pointy teeth like most other morays. I'd close up the top as eels tend to try to escape. Find a asian food market. Cuttlefish, apple snail and whole shrimp are good meals - there are many others. They can do just Ok on the tails and meat, but the whole specimen will get them more nutrition. Stay away from just fish or freshwater meals. Thanks for all the responses! I do have the top sealed and weighted. When I visited the Monterrey Bay Aquarium last, I was amazed to see that they had scarlet cleaner shrimp in their mixed eel tank with the shrimp picking the eels clean and the eels not seeming to pay any attention.. I have two scarlet cleaners in my tank which have now set up shop outside of the eels den. Tonight they were fighting with the eel over the silverside I accidentally dropped. The eel obviously won and the shrimp let him have it. His eyesight seems to be pretty terrible and I wouldn't be surprised if one of those shrimp end up in his mouth one of these days. 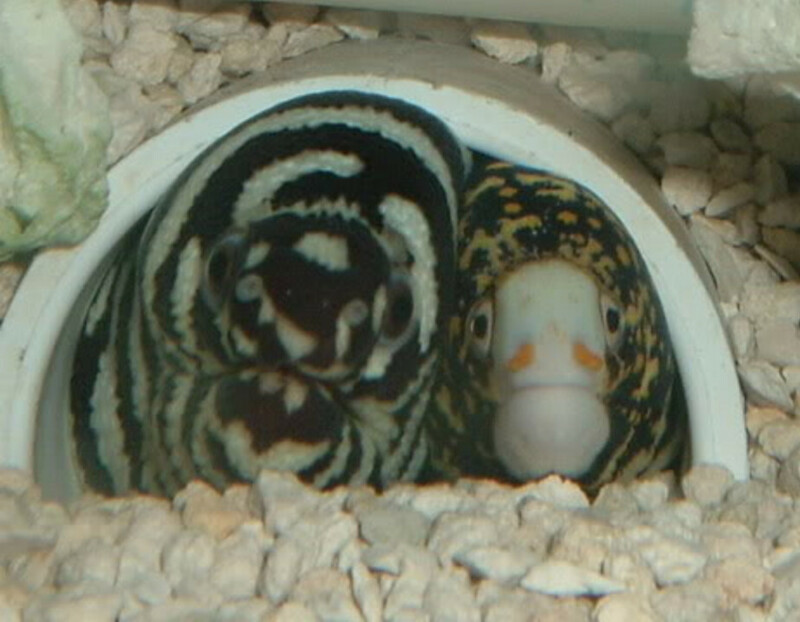 Have any of you tried or currently have, an eel in your reef? I like the idea of teaching him small fish are not dinner by feeding him other things. When I used to use the seafood medley, it was cooked. Some of my fish would eat it and some would not. That is a good place to start. If it is raw still, then that is a jackpot. Stay away from imitation crab. A lot of people misunderstand the pebble-toothed eels. They are really not all that aggressive unless you are a bottom dwelling crustacean or they have been starved. I went to the Pacific Ocean Market place in Broomfield and bought an assortment of raw foods to make my own medley . Most of the packs were around a pound and ranged from $2.99 to 4.99. Apple snails: he attacked and chewed on one for a while but eventually left it for the fish. They were really rubbery, I would have spit it out too. The package was in a language I dont know and they might not have been raw. Squid tentacles: A total hit with the eel, He loves those too. How is that maze looking these days? He's doing really well, despite the eel scare. The eel left no marks. The best I can guess from looking at pictures online, he has 1/2 way transitioned into adult coloration. He still plays nice with all of the other fish and corals, no issues at all. I don't know if Dr. Marini mentioned this in his great article, but these can sometimes "hibernate" for a few weeks where they don't come out and won't eat. DO NOT sweat this and DO NOT try and sir them up. I noticed it more with Zebras than the others, but it is very normal. Also, don't be worried if they do not eat every day. BTW - I would nearly always have a pebble toothed eel in my tanks, but I do not have tight enough of a lid/screen. They are really cool and oft misunderstood. Thanks for that Doug! My zebra eats like a horse for a while and then just stops coming out not matter how long a wiggle the food near his den. He also lives close to a large coral banded shrimp that continues to molt and has antennae spanning over 12". I have screens but they are not tight if he wanted to he could push them off or just go into the overflow and exit that way. 2 month update.. Apparently my eel had read that reefkeeping.com article because it behaves exactly as the article describes. It has been a really fun addition to the tank. I have an anthias and an angelfish that have become buddies with it. Sometimes it looks like those two fish are kind of backing up to the eel the way that they do with cleaner shrimp as if they think it will clean them. Maybe they are just being territorial and pushing it away. Either way, none of them seem stressed in any way. It gets along with all of the other fish just fine. The eel isn't a picky eater. I have been working through packs of squid tentacles and cuttlefish. I have to chop them up small enough so he can swallow them otherwise he will abandon large pieces of food and I have to go in and get them out of the tank. I bought Eheim 600mm plant tongs to help with target feeding and they work great. I was using 20" tweezers and kept losing the food. Overall, I love the dynamic that the eel adds to my reef! BrianH, SynDen and TheRealChrisBrown like this. I will see what I can do. It hasn't been out for the last couple of days. I'm thinking it might be starting a "hibernation phase" like jda and Mike we talking about. ...still in "hibernation." Does anyone know what the biological purpose of this hibernation is? He does seem to switch caves periodically.